Are you working through a nonfiction unit surrounded by articles with clear claims and arguments? 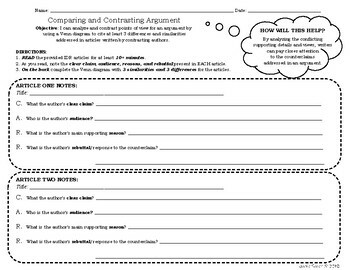 Maybe you'd like to see your students trace the argument in two paired articles and then compare and contrast the authors' views and evidence? If you've said yes to the above questions then you will absolutely want to download this product! Using the C.A.R.R. 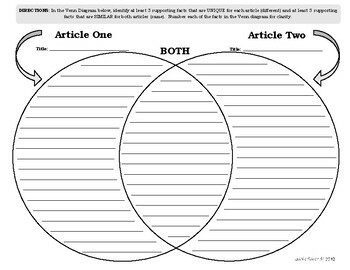 argumentative writing strategy to close-read any two informative articles of your choice, your students will work through this document to compare and contrast the articles' arguments in a Venn Diagram. With a clear structure and easy-to-understand format, this document would work perfectly as a formative assessment or an independent reading station worksheet.